Nordic Testing Days 2017 Recap~ 11 min. 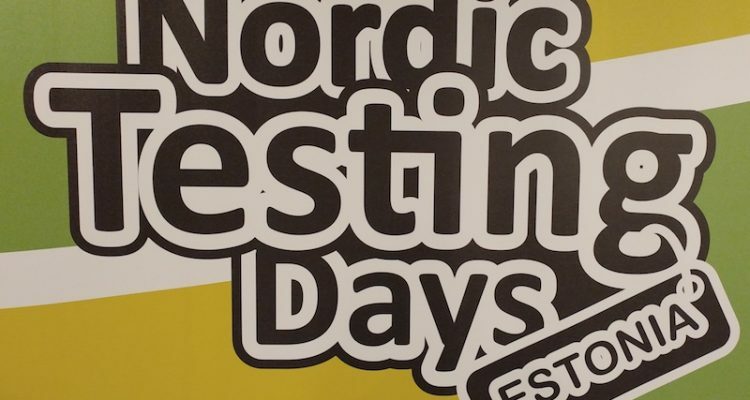 As I wanted to go to a testing conference this year, I was looking around the internet and found the Nordic Testing Days in Tallinn, Estonia. The schedule sounded really interesting and it was really affordable, so my decision was quite easy. And what can I say: It’s absolutely worth coming here! The first day is over and I have heard quite some interesting things and meet great people. In the morning I wanted to take a taxi from my hotel, which was located in the old city centre, because it was raining and I was carrying my macbook. Unfortunately lots of others had the same idea, so that I ran a little late and missed the beginning of the keynote – therefore there’s no sketchnote about it, but I have made some notes anyway. Henrik was talking about the changes in the internet usage behaviour – people nowadays are so overwhelmed by content (they get at least 8 hours of content per day and you can see it, because phone batteries are always empty in the evening), that they just consume and don’t have the time to do anything else. They don’t even have the time to learn how a button works. The difference between something complicated and something easy and fun is one click, so you have to become easier to be understood. There are more and more mobile users from everywhere, not only the western countries. Internet has to change and to adapt to be for everyone – if you are not for everyone, you are for nobody and pointless. For some of the people, the mobile phone is their first and their only computer. Chinese people don’t use phones, they use WeChat. That all means that you have to change your way of thinking. A product is something that does things for me. For example people don’t want to make a report, they want to present it – they want to press a button and let the machine do it. Simplicity is a good user interaction design, always keep that in mind. Nicola was talking about the difficulties testers have as their role as seen in different ways which aren’t always that positive. Often when there is a bug in production, almost immediately follows the question „was this tested“. You evaluate what was missed, how serious it is and how it could happen. You try to find a way that this will not happen again and it might even be, that testers aren’t trusted that much anymore after such an incident – that is not a good feeling for testers. We all have to learn how to deal with each others as people, because there often is a missing value for testers. They seem to never be satisfied, to always be negative, to complain about everything or to „just be testers“. That is why testers should watch out for the stress curve as the stress level should be kept as low as possible. You shouldn’t be like a coral and just explode out of nothing when you crossed a point, but you have to talk to your team members, coworkers or even your scrum masters to change this kind of behaviour. Team harmony is crucial – you have to stand up and care for each other. Therefore having a thick skin cannot be the solution, but humanity is. Alan was giving tips for us on how to be able to improve ourselves for being better testers. He said that we are not born to be testers, but we have to learn to ask questions. Questions can change the way we think, but we have to know for what purpose we are asking them. A lot of people just fell into testing. Therefore, especially in the beginning, you have to read and learn about testing and stay up to date on it. Try to spot things that are different and then develop your understanding of testing from this. You should avoid to make assumptions on how things work, but start to really find out how they work. Everything is as related as you make it, so pay attention to the conclusions you make and even question the answers on your questions. You need to take responsibility for your test approaches and take control of what you are doing. Reflect about how you are doing things and what can be improved. Also have a look on how others do things to find out if that might be better and then learn from it. 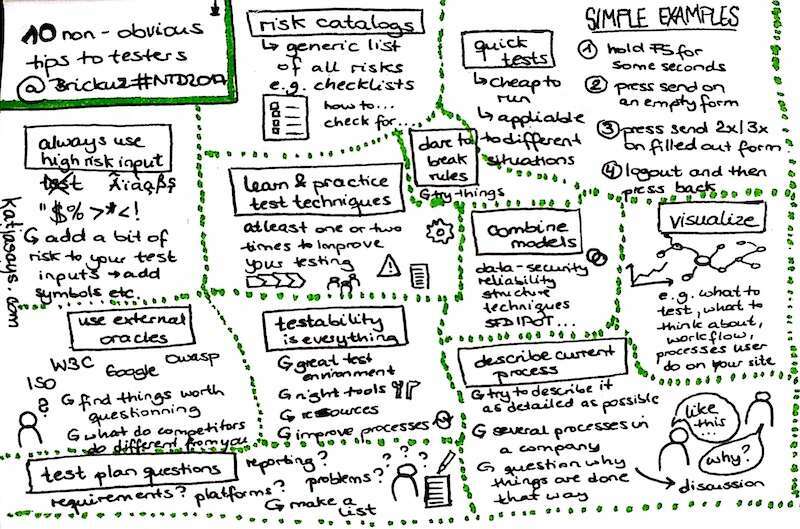 Basically you have to create your own model of what to test and how to test it. According to Amit threat modeling is a design review meant to find security concerns. It addresses architecture security flaws and shares a team understand of risk. How can you do it? First you have to scope and think about who might want to attack you and what assets you don’t care about. Then you should get a model. You should keep it simple and clean so that it is easy to read and to understand. You should look at data flows that cross boundaries and ask whether they can be spoofed, tampered or leak information. Then you can do some unstructured (mind map, free discussion) or structured (personas, categories of attackers, attack trees) brainstorming. In the end you should wrap up. Ideally you should do the design review in the beginning of a problem, but later on it will still be very useful. Set the goal to improve every day and to share your knowledge, so that others can improve as well. Make the developers care about the feedback and try to set yourself some goals. Melissa thinks, that integration testing is something between unit and functional testing, but that it is a layer and not an individual test. With it you can test the boundaries of your app and also your API. You can group functions together and test them in aggregate. In general she recommends to just write tests that give a value and to use declarative UI and functional programming tools. 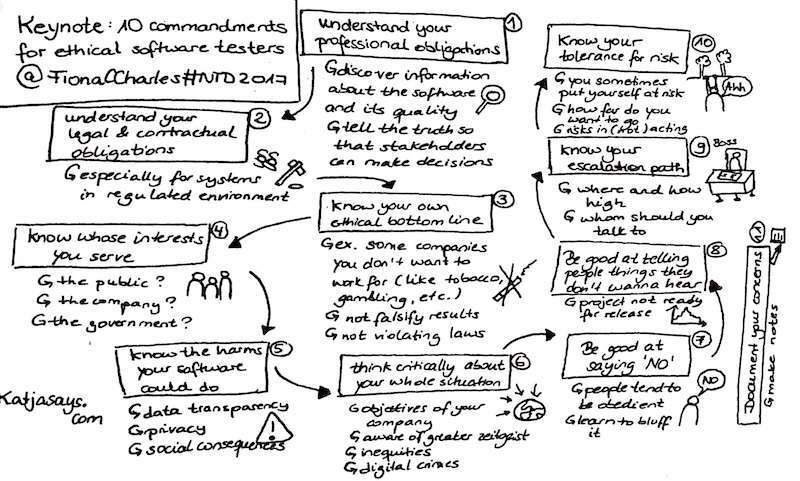 As a tester you should remember, that you shouldn’t test everything but just those things that give a value to the business. You should test according to what your real users do on the page and keep in mind, that people buy just those things that give them more value. You need to change your mindset and ask yourself if the things you do give any value to the business and what is most important for the business and the user to test. Don’t forget about the risks and their cost. You can convince the business to start testing by using numbers to show the risk and damage of losing a user if something doesn’t work the way it should work. You can also argument with the user experience, because if something doesn’t work, is too slow or is too difficult to interact with, the user will not bring you any profit. Now there are more than 100 robots driving through several cities throughout the world. Therefore rapid learning is possible through the collected data. As the hardware was changed frequently, writing tests wasn’t that easy. The main computer is pinged to check if it’s working and for ensuring reliability, the rollouts are gradual, immediate rollbacks are possible and there are fault detectors. As there are robot handlers, an intervention is possible at any time and there are lots of real life test cases, so that bugs in the software can be found and eliminated really fast. I really loved the conference. The organization was awesome, the location was central and had enough space for all the attendees, and the talks and speakers were of high quality. I’m definitely looking forward to the next Nordic Testing Days!